Growing a greater understanding. As a leading responsible paper manufacturer, Boise sought to educate customers on the concept of managing forests sustainably. 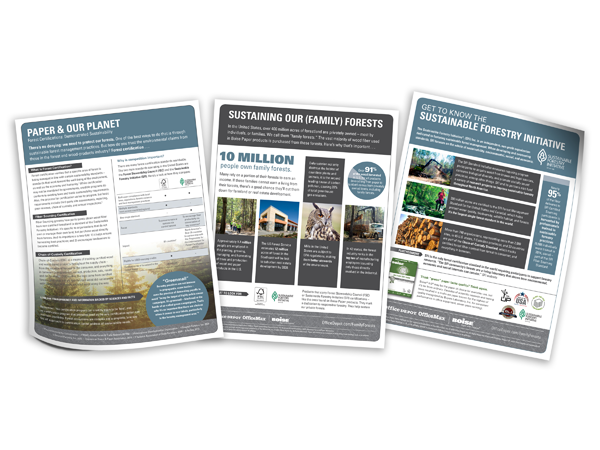 Evoke designed sell sheets to make it easy for the Boise team to explain sustainable forestry in a visual and factual way. Our Chicago creative agency provides freelance marketing and graphic design solutions in St. Charles, Geneva, Batavia, Aurora, Naperville, Fox Valley, Wheaton, Lisle, Glen Ellyn, Hinsdale, Oak Brook, Elgin, Schaumburg, Evanston, Northbrook, DeKalb, Joliet, Chicago, Chicago Suburbs, DuPage County, Kane County, Lake County, Will County, McHenry County, DeKalb County, Cook County, Illinois, Wisconsin, Indiana, Michigan, Ohio, Missouri, Iowa, Minnesota, Midwest & worldwide. Copyright © 2019 Evoke Idea Group, Inc. All rights reserved.